People have been waiting for The Dark Tower to make it to the big screen. Well, here we are! God bless Idris Elba. He is an international treasure. Could prove to be a good case study on what not to do when given a beloved book series, and a potential new film franchise, and you completely mismanage and bungle the whole thing. This is one of 2017’s most baffling films. How did this go so terribly wrong? Remember the McConaissance? Yeah, those were a few good years weren’t they? 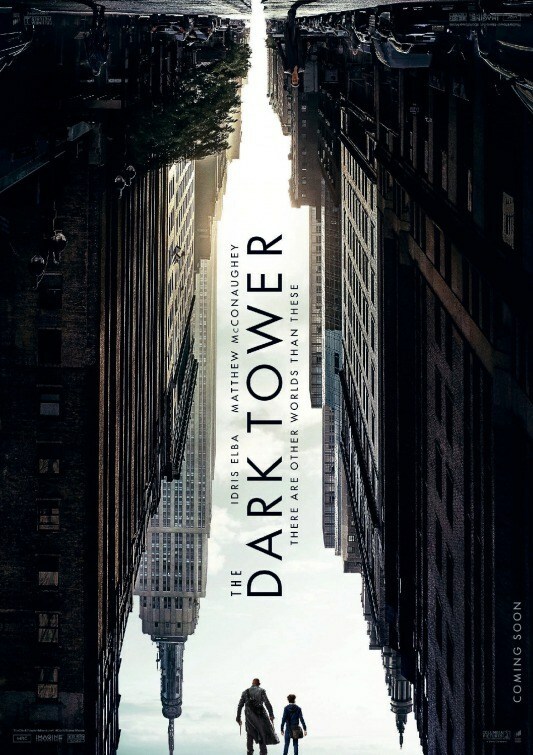 The Dark Tower is what happens when everyone thinks they are the smartest person in the room, no one listens or relents for the good of the team, and egos and hubris prevail. Also, a reminder to not let Akiva Goldsman come anywhere near your source material. Though it is full of little nods and winks to Stephen King‘s books and stories, almost as if in some form of an apology to the iconic writer, The Dark Tower forgets that perhaps the first thing a movie is meant to do is entertain an audience. Or tell a good story. Or provide even a decent experience at the multiplex. Or offer viewers good dialogue. You know, anything that shows they have a clue what they are doing. Instead, the long-delayed, troubled film adaptation of what many have called King’s “Lord of the Rings”-style saga, dies on the vine, and that death sure ain’t pretty folks. 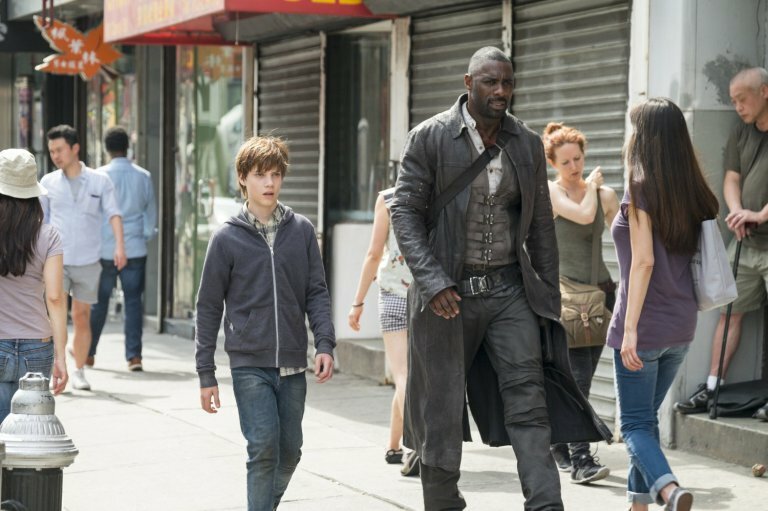 For 95 minutes, The Dark Tower spins its wheels and leaves you feeling absolutely nothing. Like zero emotion. Trust me, few films generate such little reaction from audiences as this one. And with Idris Elba and Matthew McConaughey starring in this long-anticipated project, one dealing with demons, parallel worlds, monsters, kids in peril, and all the rest, everyone involved deserves better. What we have is a nonsensical car-crash of ideas and concepts from a good director, Nikolaj Arcel, who seems way out of his league, trying to manage all of this. Arcel is also one of a quartet of screenwriters (including Akiva Goldsman, butchering yet another adaptation), who clearly failed to reach consensus on how to best adapt and continue King’s eight-part book series. So they double-down and try and tell all of it. Or some of all of it. And I know that last sentence makes no sense. Neither does the movie. Much has been made of the difficulties that plagued The Dark Tower from moving from page to screen, but if ever a film lacked vision or focus, it is this one. We have a story that is basically a coming-of-age tale of a young boy having dreams and visions of a parallel world where two men are waging a war with a gigantic tower drawing a distinction between their beliefs and ideals. The boy, Jake Chambers (Tom Taylor), is at odds with his mom (Katheryn Winnick) and stepdad (Nicholas Hamilton), who feel his visions, drawings, and wild stories are a direct result of a mental unraveling following the tragic death of his father a few years prior. He continually shares his drawings with best friend Timmy (Michael Barbieri), who could not care any less (standing in for all of us, I guess), about what Jake sees and experiences in his dreams. When a male and female social worker come to take Jake away for a psychiatric retreat, he recognizes that the man has what appears to be a sewed on face, a direct correlation to visions he sees in this alternate reality. Evading their grasp, he gets lost in New York City and stumbles upon a teleportation device that transports him to Mid-World, the tangible iteration of his dreams. It takes us almost a quarter of the movie before we encounter Roland, the Gunslinger (Elba) and we learn that Walter, the dastardly Man In Black (McConaughey) is already in pursuit of Jake. Naturally, the Gunslinger and the MiB have history and for reasons never explained in the movie, McConaughey’s sorcerer seizes children, harnessing their brainwaves and energies to try and destroy the Dark Tower. So, like, how does that work? Why children, exactly? I think I have that jotted down somewhere around here. Is it in Book 4? Book 2? Did they invent that? It doesn’t matter. Honestly boys and girls. It really doesn’t matter. McConaughey’s on autopilot, having a ball I guess, whispering lines of ridiculousness that he cannot even care enough about to properly sell. Elba is the one who suffers the most, because he is truly attempting to make something meaningful out of all of this. The film’s only memorable scene comes when he and Jake return to Keystone Earth (um, what the Mid-Worlders call our normal everyday Earth), and ride a subway, eat a hot dog, and drink “Sugar” (really Coca-Cola, but Elba curiously hides the logo). That the best scene in the movie lasts a couple of minutes and is written to provide a break in the non-existent “action” is troubling. In an initial cut of the film showed to test audiences, feedback showed that preview audiences had next to no idea what was happening in Arcel’s first draft. The studio brass became angry and wanted to bring in a new director, more writers, and recut and reshoot large portions of the movie. They apparently hashed out everything, but this feels precisely like a film which has a dozen or so individuals having the final say on what the movie should look like. The Dark Tower is a mess. A boring, confusing, annoying film that never commits to whether it is a horror film, a suspense/thriller, a Young Adult dystopian sci-fi adventure, an action film, or even a supernatural drama with comedic breaks. The sooner everyone involved can put this film in their rearview and move on…the better we all will be. Starring: Idris Elba, Matthew McConaughey, Tom Taylor, Katheryn Winnick, Claudia Kim, Fran Kranz, Jackie Earle Haley, Dennis Haysbert, Abbey Lee, Nicholas Hamilton, José Zuñiga, Victoria Nowak, Ben Gavin, Michael Barbieri, Andre Robinson.